You work fast Don. With this tempo you will finish before me. The modes and weight are what could be expected with high arching and thin plate. Could you share some sideviews? Top arch is 18mm, back just under 17. Presently roughing out scroll, after making a special turntable for the job. I had been using my plate carving turntable and holding the scroll to it with screws, but I didn't like that. 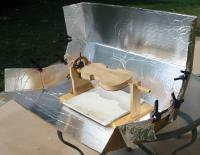 The thumbwheel and wedge of my new design is much more solid, and infinitely faster to flip around to the other side. The rotation axis of the turntable is at the eye of the scroll, so most of the time I don't need to secure the table in rotation... friction is enough. I like to be able to spin-carve-spin to get the flow of the scoll smooth. As usual (or perhaps even more than usual), my eagerness to check the sound overpowered any ideas of efficient work sequencing, so a whole raft of finish work has been left for later. Anyway, here it is, with the temporary fittings, crappy old strings, etc. Under the bow, the very strong CBR output (one of the distinctive features of the Jackson) is evident, even though it doesn't show up on the impact response. 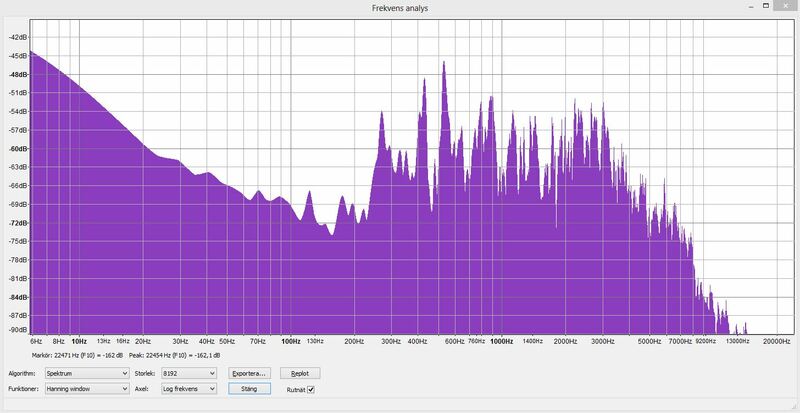 It is only 1 - 2 dB weaker than the A0, according to the microphone. Very broad, strong response in the range of 1500 - 4000 Hz is another Jackson characteristic, and I think that is evident in this one, too. The third Jackson characteristic is modest output in the transition hill range, relatively peak-free. Well, there is that pesky peak at 934 Hz on my version, but otherwise it's fairly low and even. Of course, varnish will move some things around a bit, but from my experience, it will be nothing traumatic... and generally sounds more refined to my ear after varnish. Then there's the settling-in effects, which also generally are tonally good. So, at this point, I'm very pleased with the result, and (going from memory of playing) I think it sounds a LOT more like the Jackson than any of my other fiddles do. Spectral measurements appear to confirm this. Eventually I hope to get some A-B comparisons with the original. Last year in the Darnton workshop, shadow line photos were taken that show the arching. I scaled them to the right size and cut them out for my templates. However, I won't follow them exactly... there's a fair bit of distortion that I don't want to put into a new build. sounds like a successful fiddle -- congrats!! And another question: Would you share the thicknesses of the front (of the Jackson and your fiddle)? 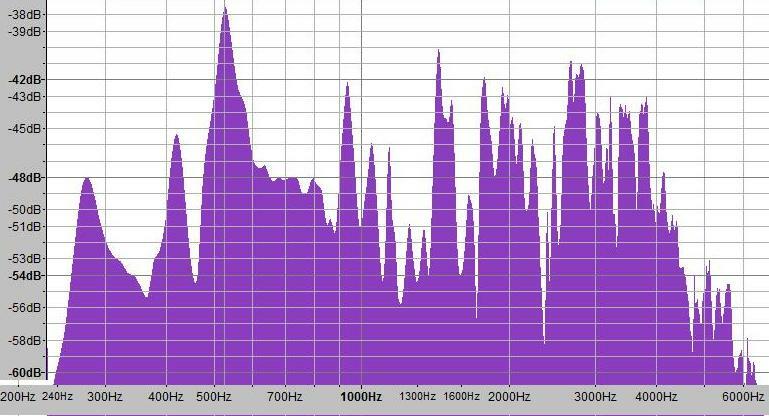 the width of the "bridge hill", extending well below 2 kHz, and a lowpoint in response ~1300 Hz or so. I feel this is responsible for the clarity and projection that impressed me on the Jackson. The G and D strings were also impressive, but that's another issue. No, I didn't try to get cycloid matching; I just used cutouts of the shadow photos. Cycloid parameters can be tweaked to give a huge range of possibilities, and probably come close to the existing arching. I didn't try too hard to make an exact duplicate, as there was obvious asymmetrical distortion that I did not want to build in. My impression of the arching is that the C-bouts do rise quickly, with little recurve, but the upper and lower bouts have quite a bit of recurve, pushing the center into a tighter radius. Here is the graduation map of the top, per Sam Z's measurements. I asked him about the two measurements in the boxes, and he thought they might indicate a repair patch. They do appear to be out-of-family, so I just went with what I thought it would be without the patches. Your point about cyclic cycloids rings loud and clear with me: Canned c-c programs do not give the correct cross arch particularly in the area of the f-holes as you found. The c-c parameters are not constant over the plate bouts. People who use c-c programs with fixed parameters usually wind up with f-holes with lower ends that rise up (too much) as viewed from the side. People who use c-c programs with fixed parameters usually wind up with f-holes with lower ends that rise up (too much) as viewed from the side. The Jackson Strad is somewhat unusual for Strads, as I understand it. One thing I noticed was the swoopy F hole, as you mentioned, that rises toward the bottom. Most of the other Strads I'm aware of don't do that. And it's hard for me to believe that it was once level, and is only the result of distortion. It's also hard to believe that he might have been slavishly using cycloids to ill effect. Do you have a photo of the other f-hole to compare? I only have arching shadow line photos, which don't show the swoop very well. My recollection from seeing it in person is that the F holes are both that way, dipping at the upper end and rising at the bottom. 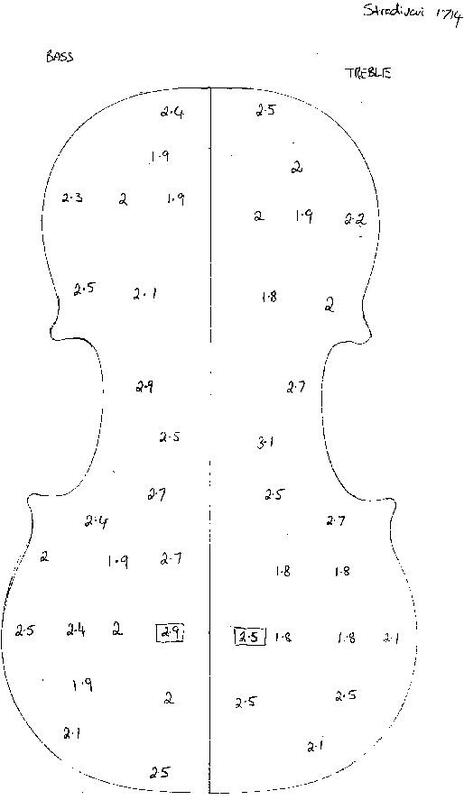 If you had a chance to see David Gusset's violin at the last VSA, his f-holes define horizontal. Over the weekend, a couple of other players tried it out, and clearly preferred it over my #12, but that preference changed completely when listening to someone else play it. Curious. I can only guess that a lot of the "harsh" frequencies on this violin are coming from areas farther from the ear, perhaps even the back. This is a fun project to follow. 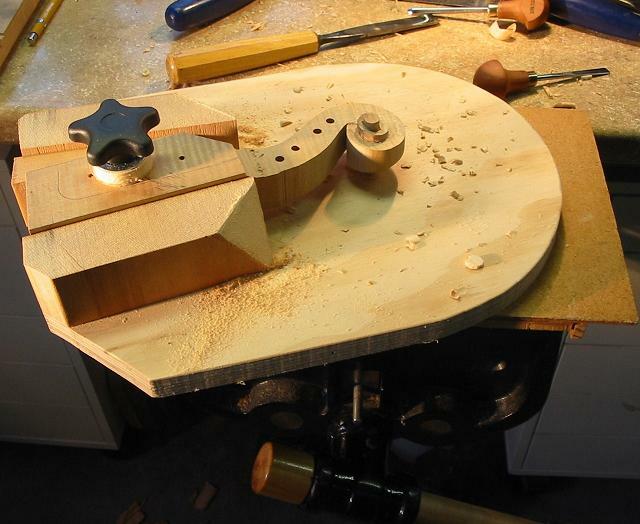 I can't wait to hear how this violin changes (for the better I'm sure) after varnishing. It' very interesting that the audience hears more "harshness" than the player. I actually like the copy the most. Great stuff, Don ! I actually like the copy the most. Just goes to show that it's really hard to judge things from a mediocre player in a small room. Live, in a concert hall, with a great player pushing it to the limits, I think you might have a different result. Or not. Hopefully I can get that kind of a shootout in the future with the Jackson. I went back and listened to some bowed scales of #12 before and after varnish, to hear what might be in store. There's a definite raspy, gritty, non-musical texture to the unvarnished instrument, and that is markedly reduced after varnish. I can't see all that much in the FFT spectra to explain the difference. There is some difference in the response, but not a biggie. So, I'm expecting the varnish to do what it has done before: refine the tone for less grit and rasp. Should be a good thing for this fiddle. That raspy, gritty stuff evaporates in a larger room, more so if the ceiling is high. If it ain't there AT ALL in the beginning you'll end up with a deflated fiddle. It's an excellent violin, Don. If it ain't there AT ALL in the beginning you'll end up with a deflated fiddle. Agreed. I like them to be a bit wild and harsh in-the-white, so the varnish will help. Mellow white violins aren't too promising. After a few days of detailing, there are still a zillion imperfections I can see with my microscopically nearsighted eyes. But I guess I'm at the point where continued dinking around won't improve things very much, and I'm tired of it. A very precise method of deciding when it's time to start varnishing. It would be great to see detailed steps of your varnishing process Don. The sunshine wasn't very intense today. A box, spray glue, aluminum foil, a few clamps, and the tanning booth was done. Faster, faster, and hopefully no smoke.